You can’t go wrong with a meatball. And stuffed with cheese? Duh. These delectable spheres of meaty goodness are served alongside a San Marzano tomato sauce and pesto mixture, and hidden inside the beef/pork combo is a melty hunk of mozzarella. Oh yes. Serve alongside a green salad with a crusty loaf of bread. Recipe courtesy of Rachael Ray. I didn’t love the parsley pesto — which is sans cheese and pinenuts. I might even substitute a pre-made pesto next time. Costco makes an amazing one. If you can’t find bocconcini (usually in the cheese section in a plastic tub with water or olive oil), just buy fresh mozzarella and cut it into small chunks. Place the torn bread in a small bowl with the milk (make sure all the bread is submerged) and reserve. In a large bowl, combine the ground meats, garlic, parsley, grated Parmigiano Reggiano, egg, salt and freshly ground black pepper. Squeeze out the excess milk from the soaking bread (it should be loose and in small pieces) and add it to the meat mixture. Mix everything with your hands to combine. Divide the meatball mixture in half and score each half into eight sections with the back of your hand. Take one of the portions of the meatball mix and slightly flatten it out in your hand. Place a cheese ball in the center and evenly wrap the meat around the cheese, completely encasing it in the meat. Transfer the stuffed meatballs to a baking sheet. Repeat the process until you’ve used all the meat. Drizzle the stuffed meatballs with some EVOO, transfer them to the oven and roast for 15-18 minutes, until golden brown and firm to the touch. While the meatballs are cooking, place a saucepot over medium-high heat with two turns of the pan of EVOO, about 2 tablespoons. Add the canned tomatoes and break them up with a potato masher or the back of a wooden spoon. Add a little salt and pepper, bring up to a bubble and simmer while the meatballs are cooking. In a food processor, pile in the basil and parsley leaves, lemon zest, stock, one clove of the garlic, salt and pepper, and zip together to break up the leaves a bit. Leaving the processor running, drizzle in the ¼ c. olive oil until a thick pesto paste forms. 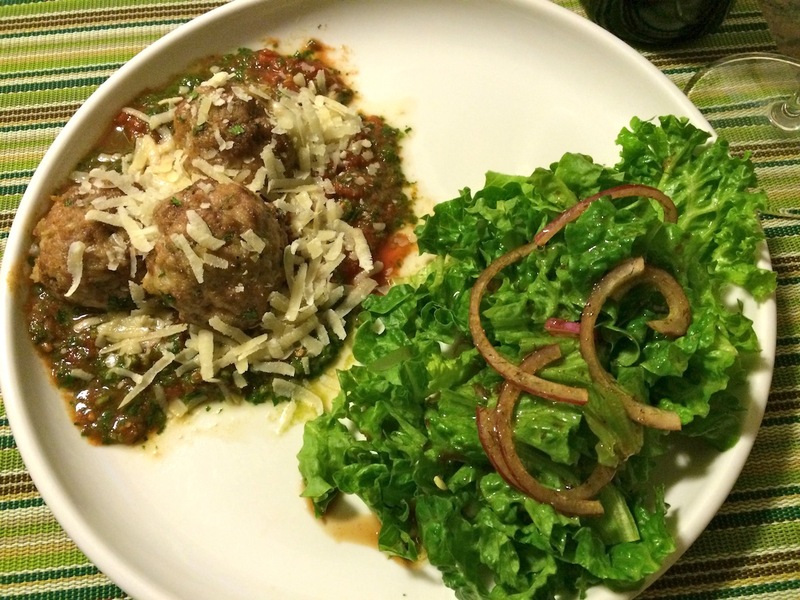 Once the meatballs are ready, remove the sauce from the heat and stir in the pesto. Transfer all of the sauce into a serving dish and nestle all of the meatballs into the sauce. 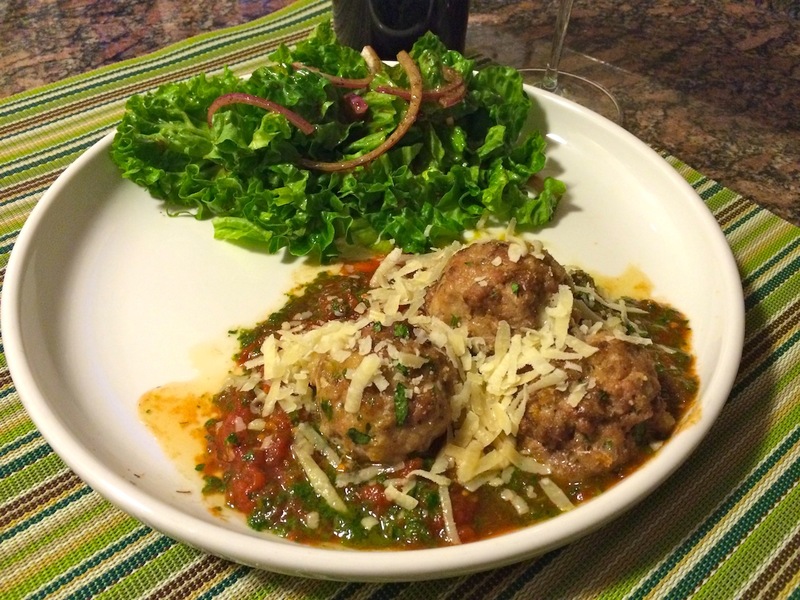 This entry was posted in Recipes, Uncategorized and tagged bocconcini cheese, ground beef, ground pork, meatballs, mozzarella cheese by Tricia. Bookmark the permalink.